This Nurse Shark was at liberty in the water for 96 days and recaptured healthy 11 miles from original tag location! The Nurse Shark (Ginglymostoma cirratum) named “Lady Linda” (Tag ID: GFR2686) was originally tagged & released by angler Ozzy Guzman on July 10th, 2015 while fishing with Captain David Ide and mate Adam Weins aboard the charter boat Lady Pamela II out of Hollywood, Florida. The Nurse Shark measured in at 68 inches total length. 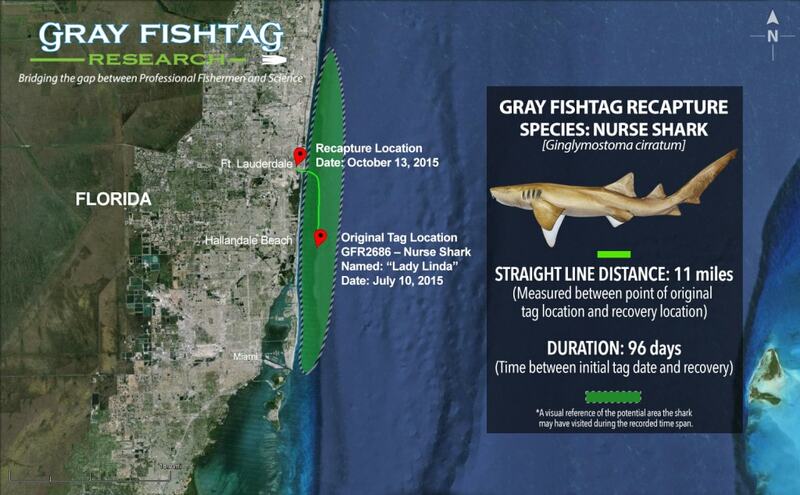 The Nurse Shark was recaptured approximately 11 miles north of the original tagging location on October 13th, 2015 by Anas Dalloul while fishing from the seawall along the intercoastal on the edge of Port Everglaes. The Nurse Shark was at liberty in the water for 96 days until its recapture. At recapture, the shark had a total length measurement of 68 inches. Anas Dalloul is an avid recreational angler who spends at least 2-3 nights a week with his buddies fishing. This Nurse Shark tag recovery highlights an important partnership and collaborative effort between professional and recreational fishermen. The Nurse Shark was originally tagged and registered by anglers with a charter fishing boat and subsequently recaptured and reported to Gray FishTag by a recreational fishermen. Collaborative fisheries science in action!! The Lady Pamela II charter boat crew will receive some Gray FishTag gear for their tagging efforts. 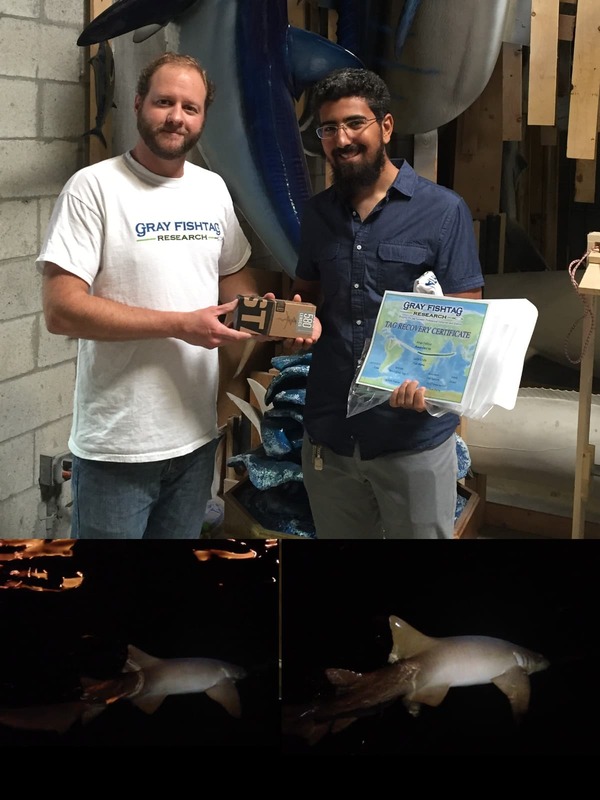 Anas Dalloul will receive a pair of Costa Del Mar sunglasses, a Tag & Recovery Certificate, and Gray FishTag gear for reporting the tag recovery. The Gray FishTag Research program has been able to shatter the mold and record higher fish recapture rates thanks to the hard working professional fishermen on the water day in and day out.